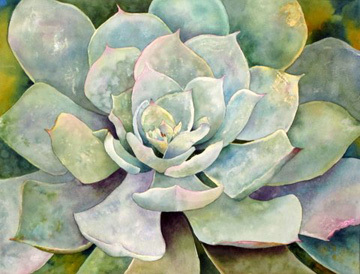 Artwork: Kaye Shannon, watercolor "Echeveria"
Beauty is in the details some say and this August members of the Fifth Avenue Art Gallery will present works that reach inside their subjects and their minds to find the inner beauty. Visit the gallery and challenge yourself to guess what the familiar object is that creates the abstract art. "Zoom" inside the leaf of a plant, the veins of a rock, the eye of a giraffe or the rainbow of crystal and enjoy that which is often hidden, overlooked or tucked inside. Also this month, back by popular demand, the annual sale on new and slightly used art books, art supplies and equipment, frames and artists original art works. This is your chance to purchase all these items at greatly reduced prices. The photographs of dogs and their owners taken on first Friday will be available Saturday afternoon during Second Saturday on the 10th of August.